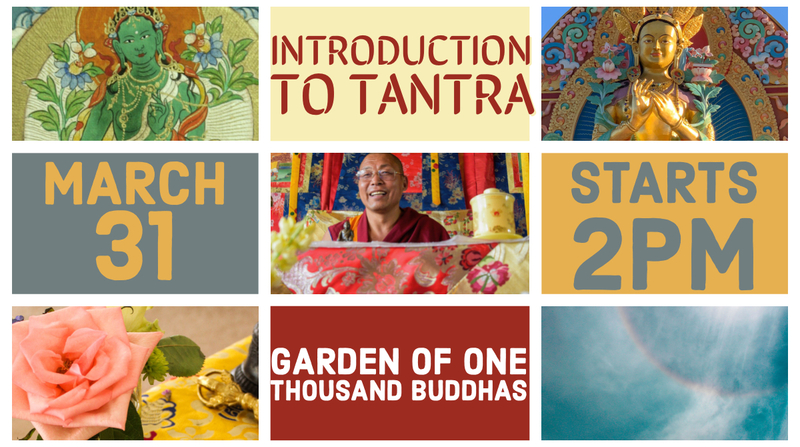 New retreats and classes are offered in addition to the current schedule. 2019 schedule will be updated periodically with new events and classes. Check back often. 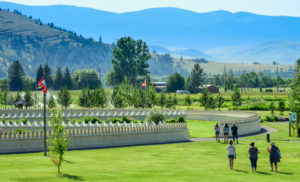 Commuter rate is for local people who will not need overnight accommodations (includes lunch on weekend retreats) and residential includes a shared or private room at one of the garden guesthouses and all meals. 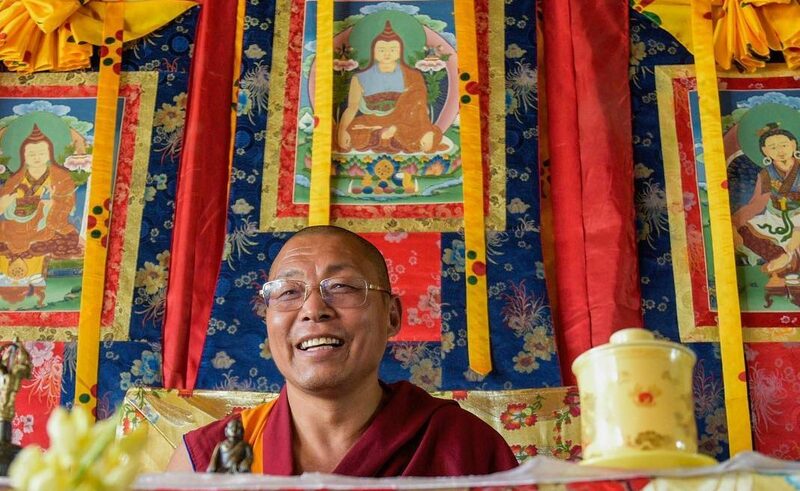 March 30th, 2 p.m. - 5 p.m.
Khen Rinpoche will go over the entire Buddhist path. 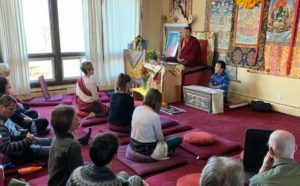 The Buddhist path according to the ancient school of Tibetan Buddhism, the Nyingmapa school, has three vehicles and nine divisions within those three of practice and study. 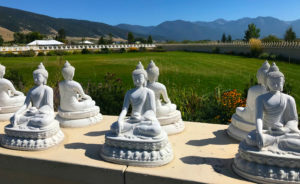 The three principle vehicles of Buddhist philosophy and practice are the Hinayana, Mahayana and Vajrayana as symbolized at the Garden of One Thousand Buddhas. The practices ascend from foundational methods such as calm abiding meditation to the pinnacle of Buddhist practice, Dzogchen. 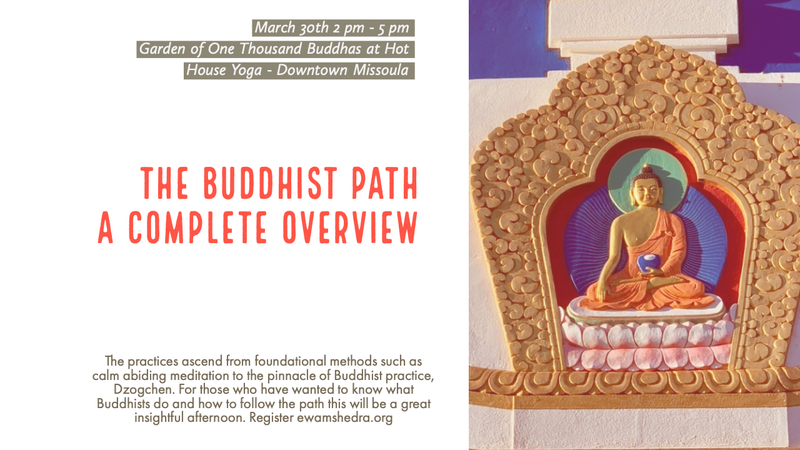 For those who have wanted to know what Buddhists do and how to follow the path this will be an excellent overview. Sliding scale for onsite and webinar, $10 - $20 including tea and snacks. 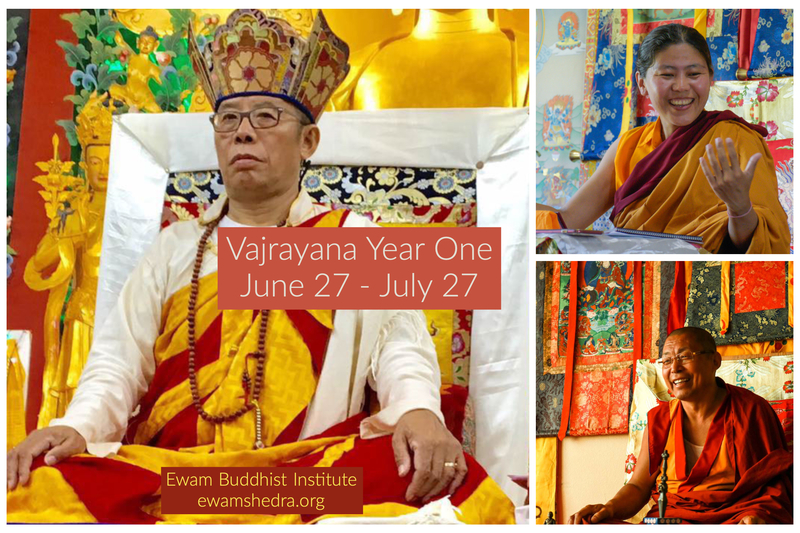 Introduction to Tantrayana otherwise known as Mantrayana or the Vajrayana is the topic of this talk. 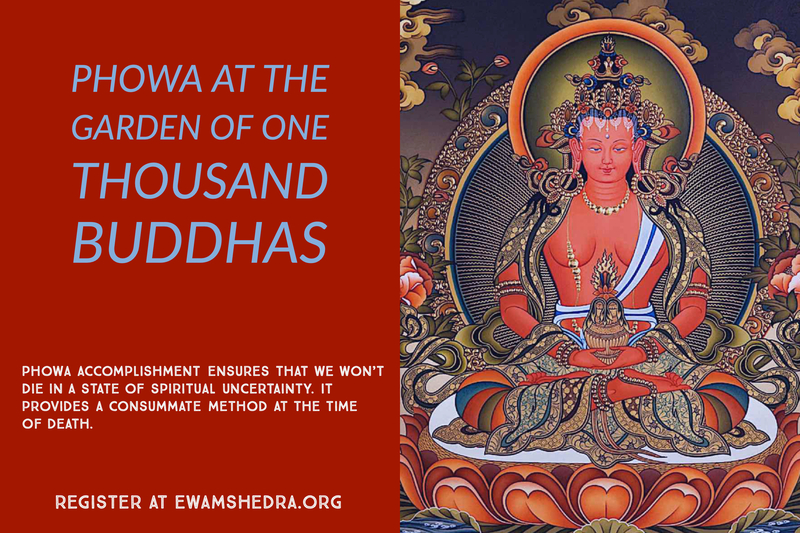 It is the Resultant Vehicle, because the path is no longer based on establishing the cause, but identifying directly with the fruition (Buddhahood). 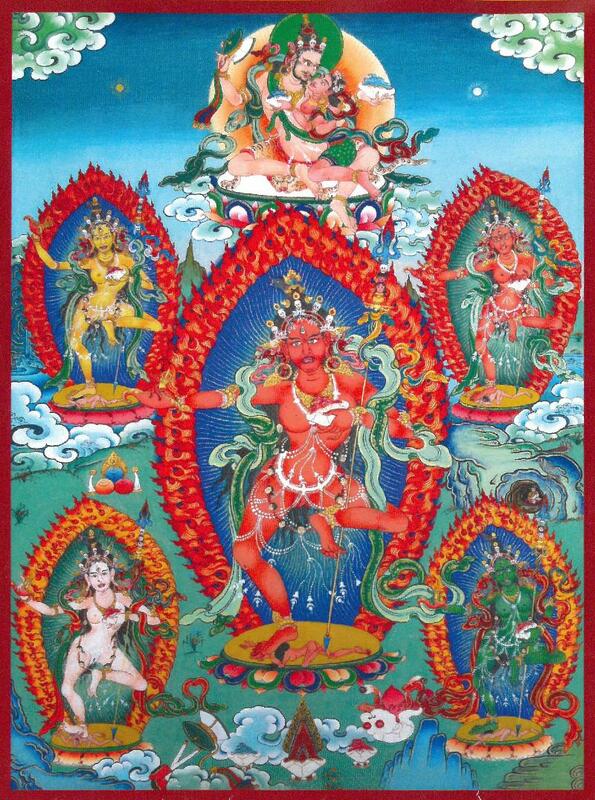 Tantra begins with the view that the final attainment or result has been within the mind from the very beginning, but has been obscured by ignorance and obscurations. 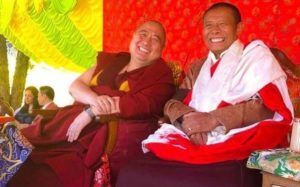 Both sutra and tantra share the same ultimate goal of enlightenment. The greatest difference between them lies in the methods employed. 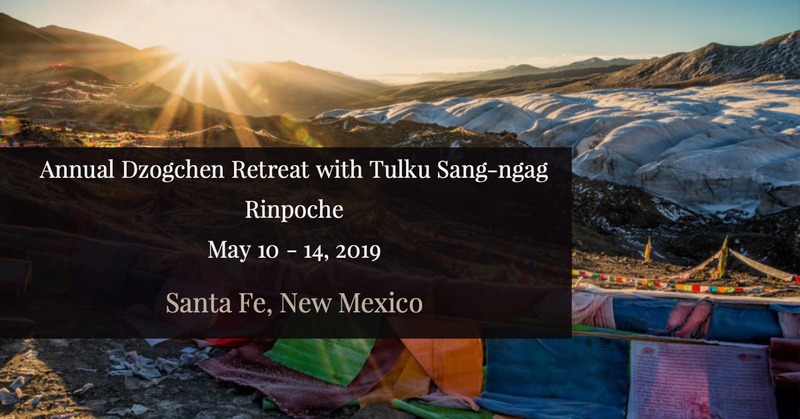 Khen Rinpoche will in addition discuss the meaning of the drubchod ‘great accomplishment” retreat happening in June and will give the Green Tara practice reading transmission; this practice helps one realize their buddhanature. Sliding scale $10 - $20 including tea and snacks. Pema Traktung is a practice of Guru Rinpoche in the wrathful form, a healing practice within the Vajrayana Tibetan Buddhist tradition. 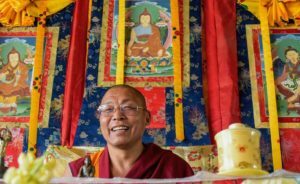 A treasure dharma spiritual practice discovered by Namchak Tsasum Lingpa. 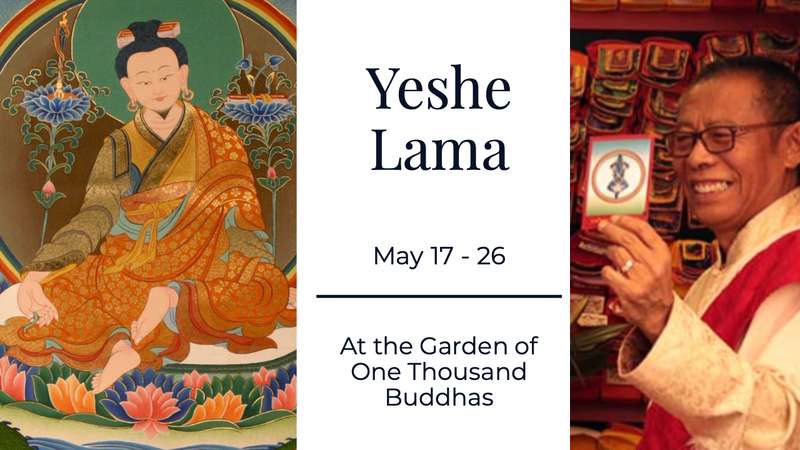 It is a vital practice on the path to ultimate enlightenment especially meant for overcoming obstacles of negative forces and removing the defilements, negative conditions of practice, and the clearing/curing of diseases including mental and physical health issues. Appropriate for all levels of practitioners including beginners. Cost: Commuter: Sliding scale $60 - $100, Residential: $150 (single or shared room). Texts not included. Retreat begins Friday: 7-9 PM; Saturday 9am-12pm - vegetarian lunch break 12-2pm, teachings 2-5pm - vegetarian dinner break 5-7pm - 7-9pm practice. 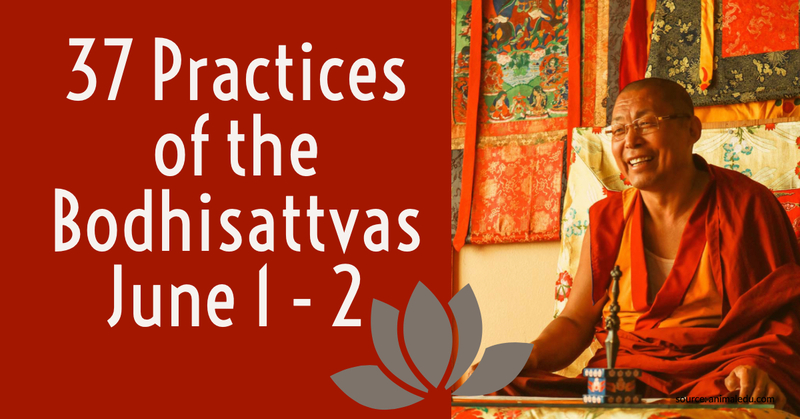 Sunday 9am-12pm - 2-hour vegetarian lunch break 12-2pm - teachings and conclusion from 2-5pm. 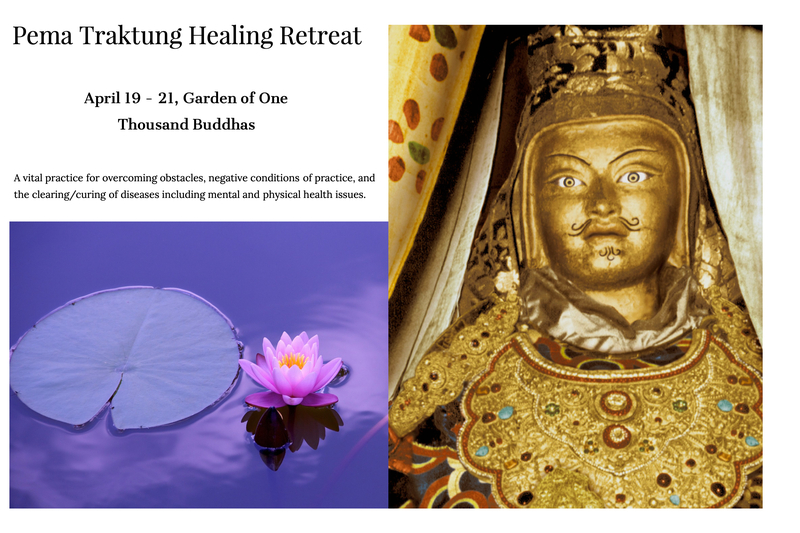 Retreat will begin on Saturday 9am-12pm, teachings - Lunch 12-1:30 - 1:30 pm-3:00pm, Buddhist refuge and Bodhissatva vows - 3:00 - 6:00 teachings - dinner 6:30 - 7:30 pm. 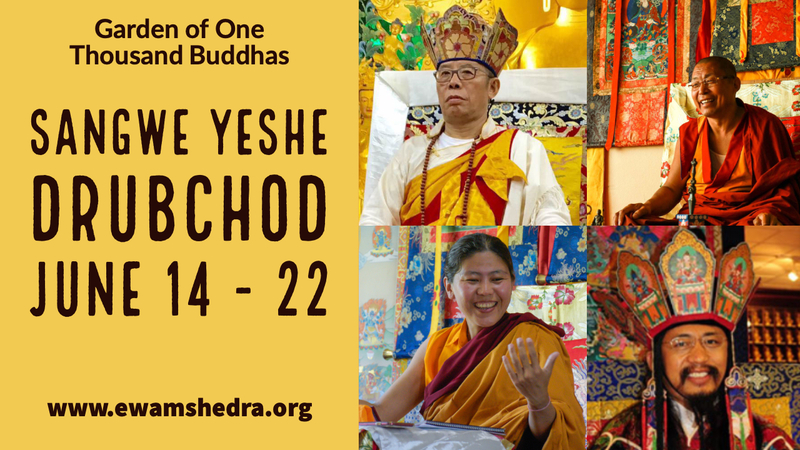 Sunday 9am-12pm - 2-hour lunch 12-2pm - 2-5pm teachings and conclusion. To take refuge is to formally enter and commit to the Buddhist path. 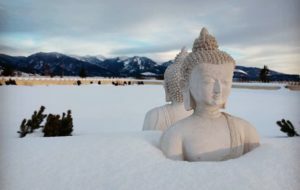 We take refuge in the Buddha as the one who achieved awakening, the dharma as the teachings that lead to wisdom, and the sangha as the Buddhist community. 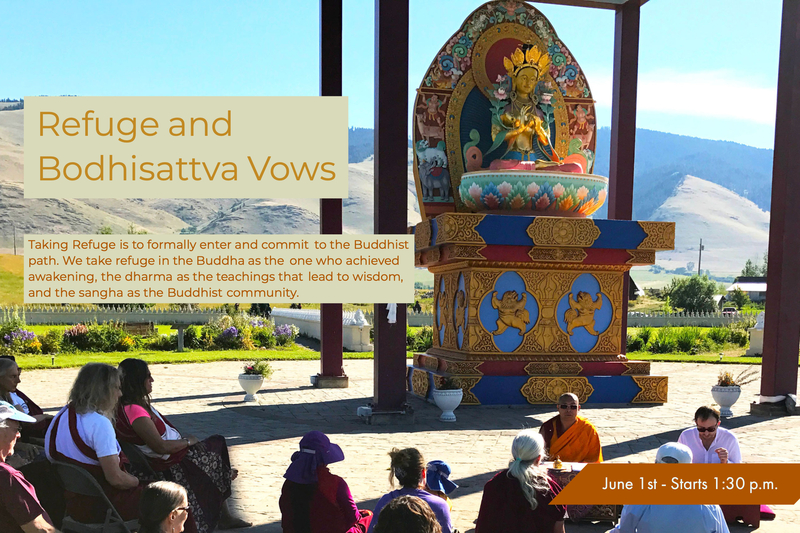 The Bodhissattva vows are the commitment to attain enlightenment in order to benefit others. 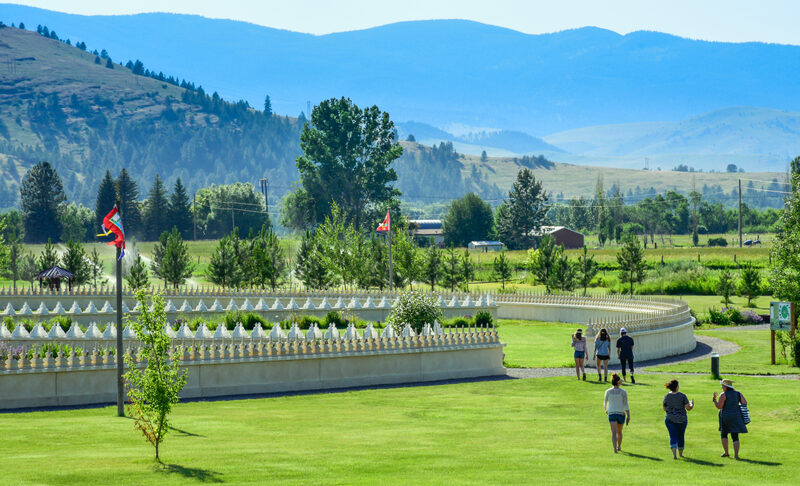 Meet at the Ewam Shrine Room at the Garden of One Thousand Buddhas at 1:30 pm. Event is free and open to all. A teacher offering is also customary at the conclusion of the vows; the amount does not matter, go with your own situation and heart. Pre-registration is not required, please arrive a few minutes early to take your seat.